Bhubaneswar: Agricultural Education Day was celebrated in CIFA campus on 3rd December to commemorate the birth anniversary of (Late) Dr. Rajendra Prasad, who was the Minister of Food and Agriculture after the elections in 1946 and was the first President of Republic of India. Agriculture Education Day is observed every year to promote agricultural education in the country for ensuring food and nutritional security of the people and livelihood security of the farmers, apart from contributing to the national GDP. Dr. D.P. Ray, Former Vice-Chancellor, OUAT, Bhubaneswar graced the occasion as Chief Guest and in his speech, he highlighted role of higher agricultural education in achieving food and nutrition security. Ours is the largest agricultural research and education system. With as many as 690 Krishi Vigyan Kendras established at the district level the research – extension – farmer linkage is being strengthened said Prof. Ray. Dr R C Patra, Dean, Orissa Veterinary College, OUAT, Bhubaneswar addressed the audience. With a record foodgrain production of 272 million tonne in the year 2015-16, India is self-sufficient in food. He added that food choices of people are changing with rising income levels. He hailed the Government’s decision to announce agriculture as a professional subject. This would bring in much needed prestige and pride for agricultural graduates. The day was marked with the participation of about 120 staff members of the Institute. Sri Sisir Mohanty, Sri Avinash Rasal, Ms Singa Soren, Sri S. K. Rath, Debasis Pradhan and Lipsha Das were awarded for winning the competition on general knowledge in agriculture held on 1 Dec. 2017 for the different categories of the satffs. Dr. J. K. Sundaray, Director, ICAR-CIFA in his inaugural address highlighted importance of agricultural education in India and expressed that there should be a uniform course curriculum in the agricultural universities for the graduate and post-graduate courses. He congratulated all award winners of the General Knowledge Competition in Agriculture held at ICAR-CIFA to celebrate this important occasion. 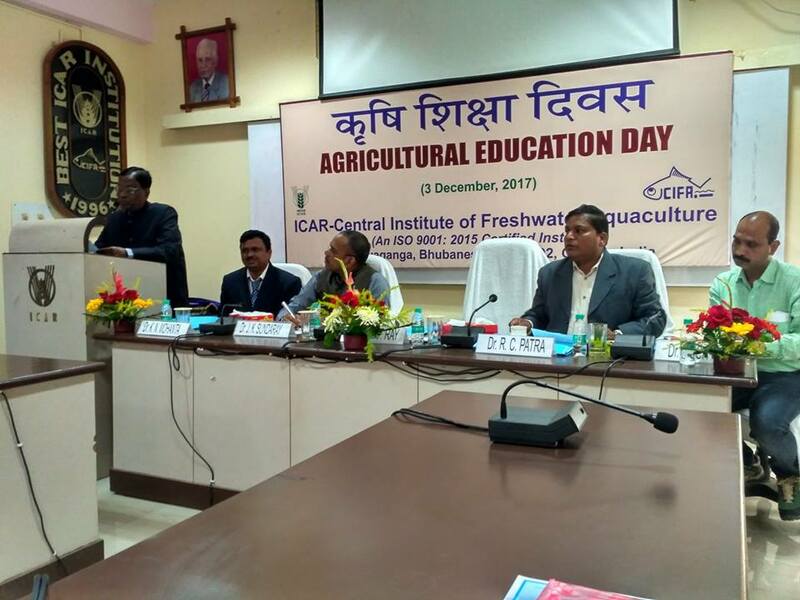 At the outset, Dr K N Mohanta, Head, Fish Nutrition & Physiology Division, CIFA and Chairman HRD Cell welcomed the guests and participants and stated the profile of the agricultural education system of India. Dr Ashis Saha, Principal Scientist proposed the vote of thanks and the programme was coordinated by Dr Lakshman Sahoo, Scientist, ICAR-CIFA.